"Woo hoo! I love this stuff, and it works so well for cooking winter stews. Mmm ... beef stew, slow cooked, so that the gravy soaks into the potatoes." I would make the ultimate boeuf Bourguignon. cooked for hours on the stove until the red wine and stock reduces to am almost syrupy texture and is deep with flavour. I am just in the process of moving out into my own place so i could def use some new pots and pans. I am not much of a chef yet but i would love to learn! For my first dish i would try to attempt some sort of pasta. If I had brilliant pots and pans (they all look delicious!) I would make skillet fried miso chicken, japanese curry, young asparagus with bacon, gamja jorim, and the most amazing eggs from Victoria over easy. 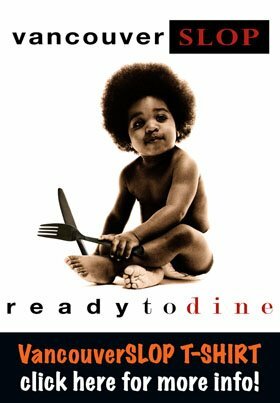 I'm hungry just thinking about it. I would make chili or some sort of soup for the kids! If I had some lovely pots and pans, I would cook my mum's lemongrass chicken. When I was a kid I would call it "smells good chicken" (translated from Cantonese) and ask my mum to make it for me all the time. If I had some awesome pots and pans, I'd cook my mum's favorite lamb tagine with roasted eggplant and potatoes, with a fresh baguette to dip in the delicious juices! I'd braise some lamb, before putting together a Moroccan spiced stew with fresh herbs, and dried apricots. Yummer! Would love to get a mortar - mash up some garlic and then use it in a variety of dishes like steamed black bean chicken or mashed potatos. Delicious! if I had Le Creuset pots & pans, I would cook some amazing items that even Joe from Vancouverslop would be impressed with. I'll be sharing my mom's recipe in hopes to remake this with Le Creuset! 1. Heat sesame oil in a large skillet or a shallow pan on high (make sure you have a matching lid). Cook thinly sliced onions until translucent. Add the meat cut into bite size pieces and cook until the meat starts to change color. 2. Add sugar, mirin and soy sauce and mix it well with ingredients from #1. 3. Top with potatoes and carrots , add about 2c of water. Cook on High with the lid on. 4. Stir the pot every 5 minutes or so, making sure the food doesn’t get burned. If the liquid is almost gone before the vegetables are tender, add some extra water. 5. When the vegetables are cooked through and tender, remove lid, stir from the bottom a few times, and let the rest of liquid evaporate a little more. Serve hot with steamed rice. 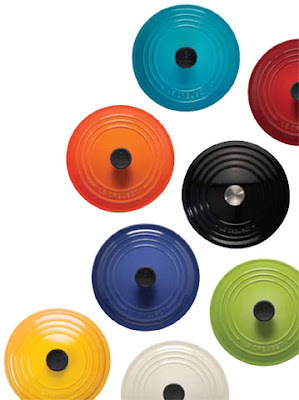 oh, pretty le creuset. I want pretty much every item in turquoise. the first thing I would make probably wouldn't be cassoulet, because that is such a wintery, time-consuming dish, but it is the first thing that comes to mind. Oh boy, if only I had a shiny new set of cookware, I'd make my fiancée some delicious mixed berry and anise pie (even though she doesn't really like pie very much). Corrie Collins sez: "If I won I'd knock up some Ils flottante with maybe a little crushed praline and raspberry purée. Yum!" " I recently made an amazing batch of homemade baked beans. They were fantastic. I'm adapting the recipe to make an Italian style of baked beans and if I could pick up a Le Creuset casserole, I wold most definitely bake up a batch. Place all of the above in a large pot (like a LeCreuset! ), cover with water and bring to a boil. Simmer, adding more water as necessary for 1.5 hours. Strain beans reserving about 1 cup of the cooking liquid. In a separate bowl mix the 1c. cooking liquid, 1 28oz can of tomatoes, a tablespoon or so of balsamic vinegar, 1 Tablespoon of sugar (brown might deepen the flavour, next time I'll try that), 1-2 tsp of Kitchen Bouquet browning liquid, Soy sauce to taste (it was a good call for the salt), if I'd had some sherry, I'd have thrown in about a 1/4 cup and 4-6 minced cloves of garlic and more basil. Return the beans to the pot and add the other ingredients. Mix well and bake in a slow oven for several hours. OR, you can do this on the stovetop on low. i brought the ingredients to a boil, reduced the heat to low and cooked the beans for about 2-3 hours, stirring frequently, and adding more liquid as needed. These beans were AMAZING!!! I'd like to do it again with a much better cooking pot!" More curries. I'm always spilling all over the place with a cast iron skillet. With a dutch over, that might not be as big an issue. Seth sez: "Hi Vancouver Slop, if I was fortunate enough to win the gift certificate I would immediately put my new pots to use cooking a meal for my girlfriend who I've been on the rocks with. I would search everywhere online for the best recipe possible and make it with love to try and win back my love!" Brian Q sez: "I have been dying to make a cassoulet. And with fall coming up it would be the perfect opportunity. The only problem is that I lack the earthenware dish necessary to make it properly. I have been thinking about this dish at least once a week since I visited France. Duck confit. Pork sausage. Pork fat. Put them all together in some brand new cookware and it sounds like a perfect meal. While there are many different regional variations on the dish, this is the recipe from Anthony Bourdain’s Les Halles Cookbook, which would be the version I’d try." And then Brian sent us the recipe. REMEMBER TO PROVIDE AT LEAST AN EMAIL ADDRESS. We need this to contact you in case you win. "If I had a new Creuset pot, I'd make my mother's recipe of Oxtail stew (which I have not made in over 10 years) which involves pre-marinating and braising 2 whole tales of oxtails, carrots, tomatoes & celery. I no longer have a pot suitable for it. ps. I'd also have to call my mom to get the recipe again, which itself is a feat since she never measures anything!" I'm of several different minds. Part of me would want to blow the entire amount of a good knife. We Vancouverites are lucky to have access to some incredible sushi-grade fish, but nothing ruins a beautiful cut of tuna like a shoddy knife. - Chili oil or Sriracha sauce to taste - add 1/4 tsp at a time until you reach your desired heat level. 1. Dice the tuna in small pieces and then chop it as finely as you can. 2. Place it in a bowl and mix in the scallions, mayonnaise, chili oil or sriracha, and mix well. Then there's the other part that says, "BUY AN ICE CREAM MAKER!" I love Creuset! With new pots and pans I would definitely be cooking stews and soups - left on the stove to develop flavour and enjoy later for dinner! I think I would try making duck confit if I had some beautiful new le creuset pots. Something I've wanted to try for a while. Braise, braise, braise. That is what I would do. I would braise short ribs, lamb, pork, chicken, vegetables. I would say when I was done braising I would.... but I would just keep braising. Braising is fun, tasty and and goes back so many years that because of the time it takes people have forgotten how. BRAISE...BRAISE...BRAISE. "Hey Guys! I love the cookware.......... and their large assortment of colours - always makes my day a little brighter! The first thing I'd cook with my new cookware is Julia Child's Beef Bourguignon!!!!!!! I've always wanted to do it but never had the guts... so to celebrate, I'll just have to step it up! And then gave us the recipe which is unfortunately too long for Blogger. I'd LOVE to own a new Le Creuset dutch oven. I would make my favourite chili recipe and use my cast iron skillet to make cornbread. CJ sez "I would cook up a pot of clams steamed with saki, cilantro, lemongrass, green onions and garlic." E T sez: "I would cook a big pot of Morrocan lamb stew served over a bowl of yukon gold garlic mashed potato." Brad sez "If I won some new cookware, I would replace my crappy frying pan and then make some fresh fish tacos!" I would make spaghetti for dinner if I won this! soups and stews!! no doubt dukbokgi and spicy chicken stew!! The first thing I would make is baked beans - old-fashioned but yummy! And then I will use them all winter to make stews and chilis ... Thank you for the giveaway! These pots and pans look great for making pastas and slow cooked braised meats in! You can't beat slow cooked meat! I'm a poet and I didn't even know it. Again, remember to leave an email for us to contact you. If you are leaving comments under a Blogger profile, please remember to check if your profile is accessible, because we won't be able to get your email address without. What we'd make if we had one of those Le Creuset Dutch Ovens is our favourite "cold weather" dish - Braised Short Ribs. It is a meal that we both find ourselves craving lately - even in these dog days of summer. In a place where we only get a handful of weeks of hot weather every year, I'd hate to ever say that I long for the cooler temperatures that the fall will bring, but the thought of these ribs almost gets me to. It's been a while so I can't even remember where I'd gotten the original recipe, but I've played with it over time so as to get it to how we like it, so I'm happy to pass it along to you. There aren't many things better on a rainy winter's night than short ribs for dinner, some great red wine and the company of loved ones. OK - now my stomach's angry with me - I gotta go raid the fridge. If I had a brand new Le Creuset (which is what I'd buy for realsies), I'd finally make a cassoulet. And maybe some no-knead bread too. Having just moved to Vancouver, I'm anxious to take some classics from back home and give them new life with all the great local produce available here. First off, dessert perogies using delicious BC cherries! "What would I cook up? Curry rice, Japanese style, of course. poured over hot rice in an oval curry bowl"
The contrast of the salty shrimp paste with the smooth creaminess of the broth is amazing! Best eaten with a hungry family. I don't have a recipe, but I've attached what is (hopefully) a worthy picture of lamb ravioli with a reduced lamb and port jus. And then she sent us a very lovely picture of said lamb ravioli. I've got a lovely little le creuset pot. It was given to me by my best man. You might know him. Aww, crap. that probably DQ's me... Anyways, that pot is great, but it's a little small for more than one veal shank. I'd love to get a bigger one so I could make a proper portion of osso buco. That, and a good goat curry. I would cook the best lentil casserole that ever came to be. if i had these pots & pans i'd cook my favourite autumn carrot soup. my kids would turn their noses up at my hard work and i'd be rewarded with an extra bowl for myself! Contest is now closed! Thanks everyone for entering. Stay tuned - we will announce a winner some time next week!